Researchers have long suggested that the smaller and more sensitive Arctic Circle is far more adversely affected by global warming than Antarctica and could become ice-free in the coming decades. Antarctica has been considered far more stable around the South Pole. But as more information trickles in, it is becoming more evident that melting around the South Pole is also accelerating and could lead to several metres of rise in sea level. A new study, conducted by the UK Centre for Polar Observation and Modelling at the University of Leeds, has given more reason to be worried about the impending sea-level rise. Researchers revealed, in a paper published on April 2 in the journal Nature Geoscience, that underwater melt, hidden to observers from above, in the Antarctic has been doubling every two decades. Using satellite techniques to infer how the ice mass around Antarctica has been changing in recent years, the researchers found that the base of ice near the floor of the ocean has shrunk by 1,463 sq km between 2010 and 2016. This is roughly the size of Delhi. The culprit for accelerated melting has been identified as warm water licking the underside of ice-sheets that extend into the southern ocean. The new study found that even small increases in temperature around the South Pole have been enough to cause the undersides of ice sheets to recede at an average rate of 5 metres per year across the continent’s coastline. Antarctica is a continent of ice, which continuously flows out into the ocean through a number of out flowing glaciers. The volume of ice the continent contains has been estimated to be equivalent to about 70 metres of sea-level rise globally. Until recently, much of the sea-level rise observed was believed to have been caused by the melting of Arctic ice and snow but in 2016 researchers found that warm waters were “licking” the underside of ice-sheets in Antarctica and had been driving a thinning of ice in the continent, especially around Western Antarctica. The new study that looks at about 16,000 km of coastline, which is about a third of the continent’s total coastline, confirms what other studies have been pointing at from isolated regions. Using satellite surveys and estimating the thickness of ice based on its floating height, researchers attempted to track the changes in “grounding lines” of the glaciers and ice-sheets. 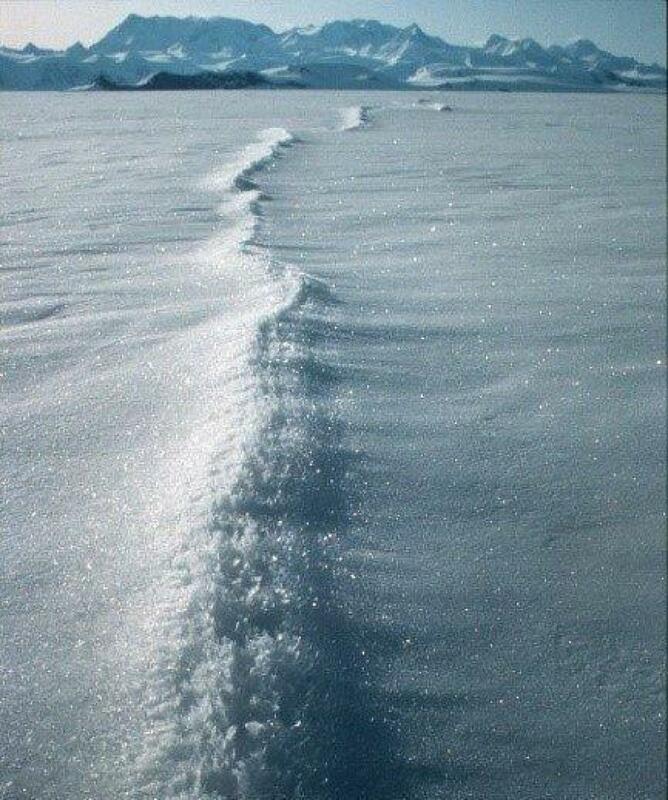 These grounding lines are basically the point at which the ice-sheet separates itself from the bedrock or ocean floor and floats as a cantilever connected to ice on the mainland. Using grounding lines as reference, researchers found that 10.7 per cent of grounding lines around Antarctica had receded by more than 25 metres per year between 2010 and 2016, which incidentally is believed to be the rate of retreat around the end of the last ice age. During the same time period, less than 2 per cent of the grounding lines had advanced at a rate of more than 25 metres per year. Confirming the findings of previous surveys and studies, West Antarctica was by far the worst affected in the continent. Most worrying is the situation at the massive Thwaites glacier which is believed to hold enough ice on and behind it to cause several metres of sea-level rise. The new research found that the glacier has been retreating alarmingly at a rate between 300 and 400 metres per year along its centre. While in the west, more than 20 per cent of the grounding lines analysed showed retreat of over 25 metres per year, the situation in the eastern parts of the continent which contains much more ice is comparatively less alarming. 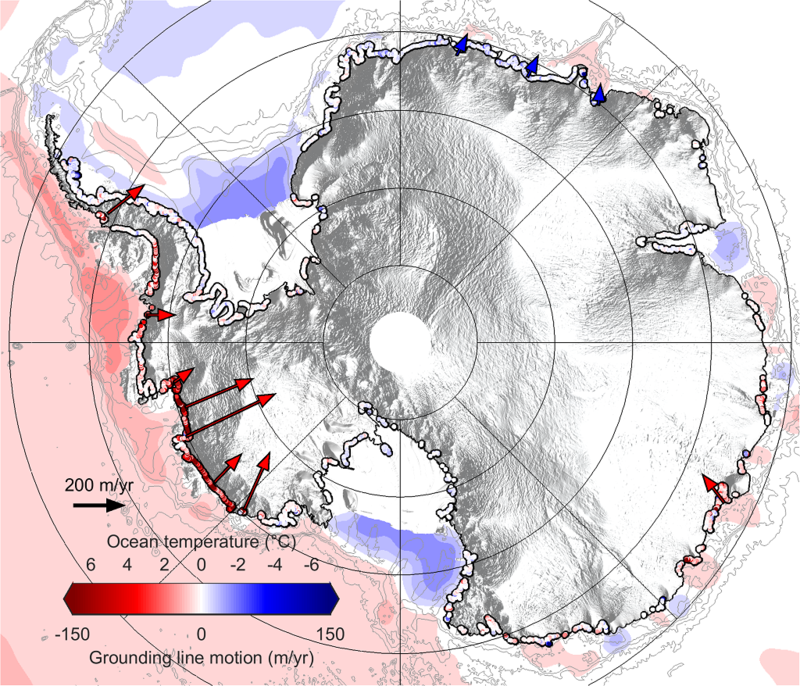 Although the largest glacier in East Antarctica, Totten glacier, is retreating at more than 50 metres per year, this is not consistent along the coast with some even showing advancement of grounding lines between 14 and 48 metres per year. The Antarctic Peninsula, situated in the west, has seen three massive ice-shelves calve into the ocean in the last 20 years. The new search found that here too, at least 10 per cent of the grounding lines were receding at more than 25 metres per year. The overall retreat though has deep and widespread implications on the amount of sea-level rise that is to be expected in coming decades. Another worrying impact of retreating glaciers on the coast is on the massive quantities of ice held inland by the coastal glaciers. Recession of the coastal glaciers could cause an acceleration of the outflow of these glaciers into the ocean. While the extent of sea-level rise owing to melting Antarctican ice and snow is still unclear, it is certain that the new findings will prompt a revision of the current estimates which are based solely on observations from two major glaciers in the West. A superb, well summarized and important article, thanks on behalf of all. But, ..... my guess, after about 15 years reading and puzzling is, the basal melting is driven almost entirely by heat and hot water coming up from the bedrock crust and mantle below, heat source tidal shifts causing those geomagnetic non-dipole field shifts in the vast metal ocean in the upper core. I can see no other way to explain the 200-plus liquid water lakes below the icecap. Hence climate change is not remotely controllable, sorry to shaft the world's favorite guilt trip. Get back if you want detail. You or anyone..